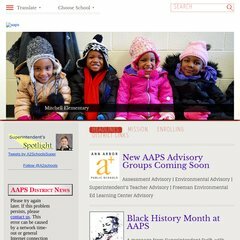 Topics: Budget, Budget-related Presentations, Aaps On Ctn-tv, Departments, Letter From Incoming Superintendent, and This Week. The estimated 281 daily visitors, each view 2.10 pages on average. Its web server is located at Metrobridge Networks Corporation (British Columbia, Vancouver.) Its 2 nameservers are ns03.domaincontrol.com, and ns04.domaincontrol.com. Its IP Number is 67.21.200.41. PING (67.21.200.41) 56(84) bytes of data.